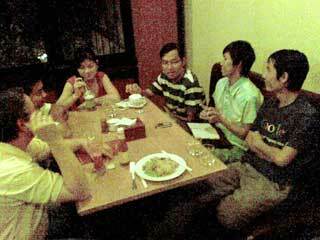 Thomas, Chantra, Virak, Phatry, Lux and more (left) at what is becoming a regular meeting of Phnom Penh bloggers. In the wake of the Clogger Summit, a number of us have been meeting to discuss new projects and plans. Stay tuned shortly for a site and mailing list. Want in? Zap an email to me or Virak.